he Liquid Lead pencil was the brain child of Don Doman, who designed many classic models for Parker, the T1, Parker “45”, Parker “61”, Parker “75” and many others. Also Francis (Frank) Meinhardt, who notably invented the textured point T-ball Jotter (today an industry standard), and many other Parker ball point pens, was involved in the Liquid Lead development. A little simplified one could call the Liquid Lead a ball point pen that wrote with liquid graphite, which made the writing erasable. At the time it was consider so innovative that it was exhibited at the Institute of Modern Art, in New York City. According to L. Graham Hogg in his book 50 years of the Parker Ballpoint pen it was mainly designed to be sold in sets with the fountain pens Parker “21”, and Parker “51”, but there are examples of many other designs, for instance a Canadian version pairing with the somewhat illusive Arrow. The Liquid Lead was added to the line rather than replacing the standard mechanical pencils, and also sold at the same price. arker had registered the trademark “Liquid Lead” already in the 1940’s, which suggests that the idea had been brewing for some time. 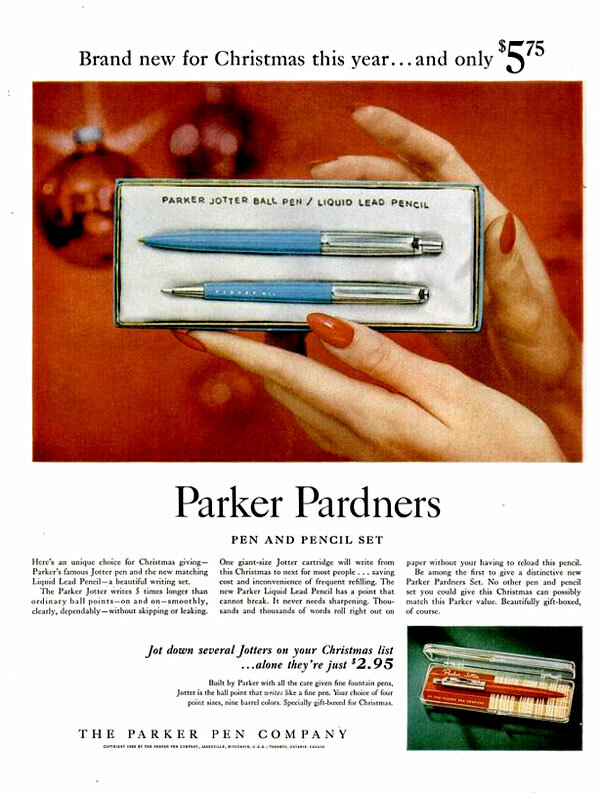 When Parker finally released the news that they were introducing a pen that wrote with liquid lead in January in 1955, they were dismayed to learn that the Scripto pen and pencil company, in Atlanta, Georgia, had hadthe same idea and, even worse, while Parker’s Liquid Lead wasn’t yet ready for distribution for another three months, Scripto’s version, the “Fluidlead” was already rolling off the production line. Well, both Scripto and Parker had the Biro/Reynolds/Eversharp “ballpoint patent wars” of the 1940’s in fresh memory and Parker had just begun to ship their own ballpoint pen, the Jotter, in the millions, so instead of getting into the patent fight that the industry expected, the two companies instead signed (in ink!) a record-fast agreement on Valentines day, February 14th, that allow them to use each other's formulas. A collection of different Liquid Lead Parkers. 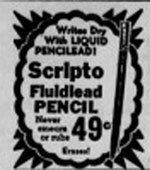 he Fluidlead was intended for the low end marked, priced at 49¢ (with refills at 25¢), and a top line model at $1, while Parker had intended to price their product at $3.95. 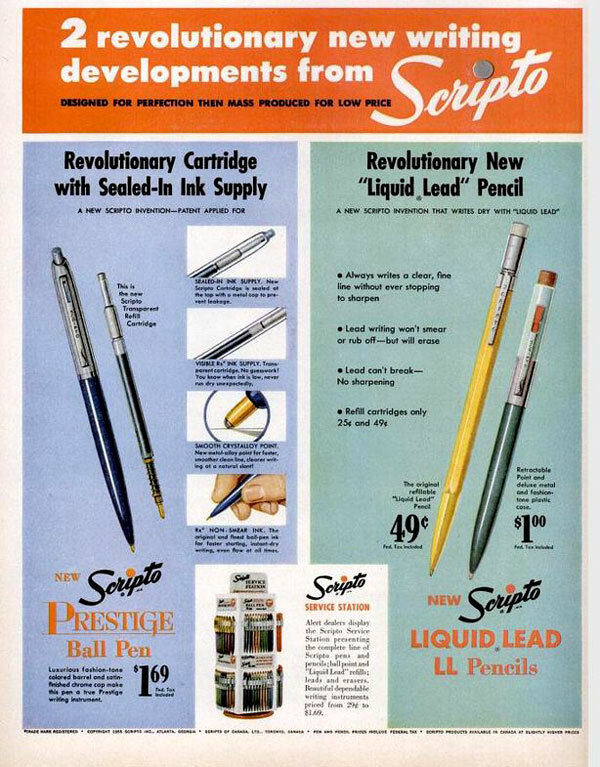 They agreed to stay in their respective markets, but as a concession to Scripto, Parker allowed Scripto to use the name Liquid Lead. This was also in the hope that the agreement would discourage the kind of fly-by-night competition that almost ruined the industry in the early days of the ball-point pen. Dan Parker was the Executive Vice President at the time and he said: "We feel that with a high-quality standard, any imitators at a lower-quality level will find it pretty tough sledding." Prospective competitors would have needed to move fast indeed. When the news hit the papers in February of 1955, Scripto was already producing 60 000 fluid graphite pencils a day. “We are sold out well into May”, said Scripto’s President James V. Carmichael: "By the time we catch up with our present orders, we will be three million units behind." To cover all eventualities, Eugene P. Cofield Jr applied for a patent on behalf of Scripto in April 1955 and it was approved already in August the same year. ames V. (Jimmy) Carmichael had started out in politics. He was educated at Georgia's Emory University and became a small-town lawyer in Marietta, Georgia, and went from there to the state legislature. Just before his sixteenth birthday, he was hit by a car. His spinal cord was almost completely severed, and he returned to Marietta High School in a wheelchair. Eventually he learned to walk short distances with a cane, but he endured intense pain for the rest of his life. After WWII he ran for governor against Herman Talmadge, (who was a white supremacist and segregationist accused of corruption). Carmichael was beaten under the state's county unit system, although he won the popular vote. Shortly thereafter Talmadge died, but Carmichael left politics and joined Scripto as the assistant to the president. A short year later he became president himself of the company. He expanded the company rapidly with ball-point pens, became the second biggest ball-point pen maker, behind Paper-Mate in Los Angeles, and the biggest mechanical pen and pencil maker in the US. He became one of Georgia's most prominent business leaders of the time. He took a one-year leave of absence from Scripto in 1951 to become the first general manager of the Georgia division of Lockheed. 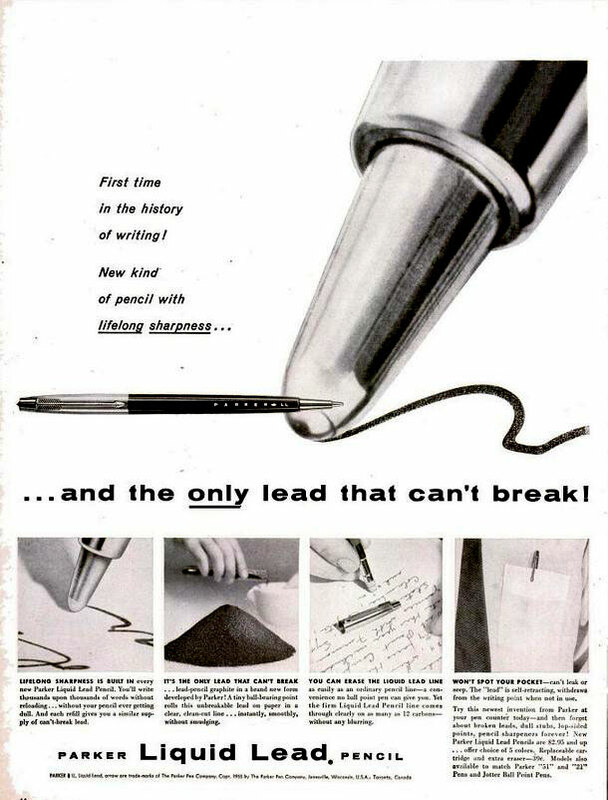 The Scripto Liquid Lead, 1955 ad. armichael now hoped that his capsule pencil would cut deeply into sales of regular pencils, some 1.5 billion of which were sold yearly. Although his Fluid/Liquid Lead model were more expensive, he claimed that one cartridge would last about five times as long as a standard pencil, which would make the long-term cost about equal. And with a pint that needen no sharpening. On Parker’s side of the fence Don Doman applied for a design patent in May 1955, it was approved in January of 1958. Also in 1955 the logo LL and LLP (Liquid Lead Pen) were filed as trade marks. An ad campaign followed, and the Liquid Lead was advertised “First time in the history of writing! New kind of pencil with lifelong sharpness and the only lead that can’t break”, and “Entirely new kind of writing instrument”, and “It’s unlike any other in the world”. It was offered at $3.95. It was advertised as “the pencil that sharpens itself as you write and can not break”. It didn’t have any actuation, the point was always visible and, like an ordinary pencil, it sported an eraser under the cap. The lead itself was thick as syrup while in the container, according to Hogg, but became runny on the ball, only to harden on the paper, so it didn’t smear. It was also washable if you accidently got it on your clothes. arker described the lead as (hold on to your hats) “An erasable writing medium suitable for use in a ball point pen consists essentially of a nondrying hydrocarbon oil, as tackifier poly-isobutylene in solution in the oil and pigment particles dispersed in the solution, the size of the particles being not greater than 7 microns and not small enough to penetrate into the pores of conventional writing paper when the medium is applied thereto by a ball point instrument. Preferably the tackifier constitutes from 16 to 32 per cent by volume and the pigment from 10 to 25 per cent by weight of the medium. In making the writing medium the tackifier may be dissolved in a volatile solvent and a light oil, the solution heated to drive off the volatile solvent and the resulting solution mixed with a previously prepared dispersion of the pigment particles in the hydrocarbon oil. Pigments specified are carbon, graphite, barium, lithol and "Monastral Blue" (Registered Trade Mark). A wetting agent such as an unsaturated fatty acid or salt thereof, e.g. oleic acid, may also be added in amount, e.g. of 1/2 to 1 per cent by volume of the medium.” Parker had a lot of faith in the Liquid Lead, perhaps most notably by the “blue diamond” design on the body. The Blue diamond was of course the old mark denoting a lifetime guarantee for the original owner. Parker Liquid Lead ad 1955.
ew US legislation had prohibited a lifetime guarantee since the late 1940, when the blue diamond was removed from the clips of the flagship Parker “51”, Now it returned on the Liquid Lead, although without the lifetime guarantee. There were Liquid Leads made in all the standard Parker “51” colours, and also a shorter model that was sold with with the Parker “51” Demi. They were fitted with Lustraloy or gold-filled Custom caps with Parker “51” style clips. Flighter and Signet Liquid Leads were also available. 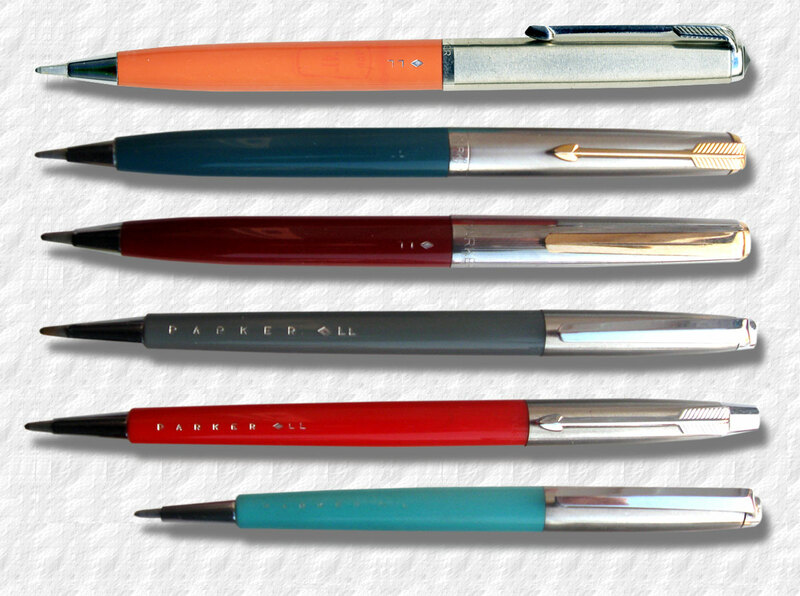 The Parker “51” Special Liquid Lead models had stainless steel caps and was offered in the colours of Black, Burgundy, Teal, Grey and Forest green. These had a ridge clip, initially made without a barrel-end nozzle, and was very similar to the early Jotters. Indeed it was also paired with the early Jotters and sold as the Parker Pardner set in the colours of Black, Coral, Turqoise and Charcoal. Like the Jotter it was priced at $2.95 or as a Pardners’s set for $5.75. 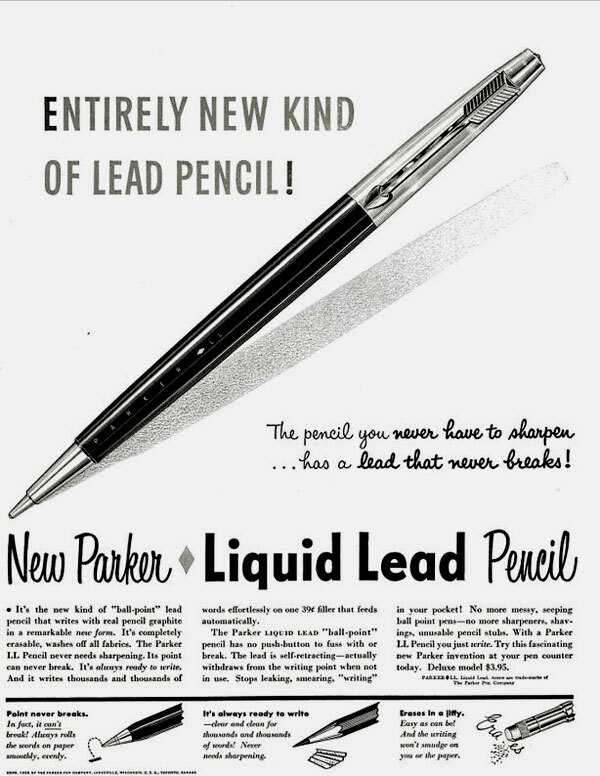 In 1956 a Parker “41” Liquid Lead was introduced, and in 1957 a Parker “61” version of the Liquid Lead was introduced. Both in the standard colours of the fountain pens. Parker sold two million units the first year of production. But it seems that interest faded with time. Some say the cartridges were too small and expensive, and the Liquid Lead was eventually phased out around 1962. The situation was about the same for Scripto. Already by 1957 the brand name Fluid Lead had replaced the Liquid Lead, and it was sold at a mere $29. By 1964 health problems forced Carmichael to step down from the Scripto presidency, although he continued several more years as chair of the board. He died in his home own Marietta at age sixty-two, on November 28, 1972. 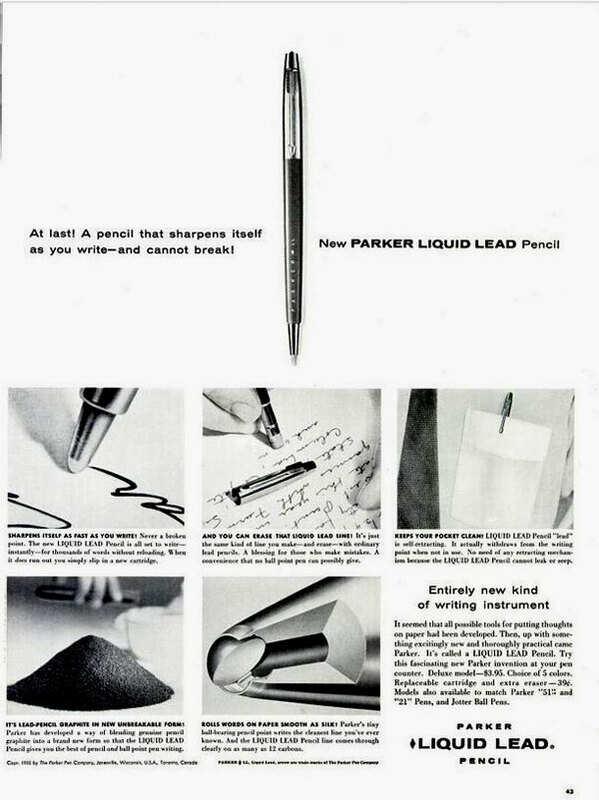 Parker Liquid Lead ads, 1955.
ut his company dusted off their old patents in 1980 and returned with their erasable ball pen in 1980, based on the original Cofield patent. Also, both Pilot and Bic worked on erasable ink in the mid 1980’s. David Cress, who worked at the Parker Technical division for many years, reveals that he and his collegues had the Sanford Research Institute work on a new Liquid Lead in 1981. He flew to California to work on the project while his collegue Bob Burkhalter flew to Germany to procure a dye. Bob Burkhalter also worked on invisible ink for the government. A special ball pen ink that disappeared when blown on with an acidic breath. To reveal the writing again, you took a basic substance like soap and rubbed it over the writing to make it visible again. Later, when they were owned by Gillette, Parker again worked on erasable inks containing thermoplastic block copolymers. he Parker Liquid Lead still hasn’t been revived, but Sharpie is currently offering a Liquid Pencil. It’s initially erasable, but becomes permanent after three days. Sharpie, who like Parker is part of the Newell Rubbermaid family, introduced the Liquid Pencil in 2010, advertised as “We’ve reinvented a classic”, and it’s still being offered. The Liquid Lead pencils are collectible, but they suffer from the obvious flaw that the cartridges are no longer in production. Nevertheless, vintage cartridges sometimes still work, more that 40 years later.